However, as we all (should) know, resistance values rise as air and material temperatures rise. Spec value is at 68°F. The coils fixed it. Since winter has decided to return to the murder mitten (Michigan), I will wait until better weather to do the fuel line, but it will be getting done as well. After swapping the coils (new ones ohmed out at 0.8 vs 0.10 on the old ones), I took it for a test drive. It now pulls clean all the way past 5,500 rpm through 3rd, 4th, and into 5th without a hiccup. I guess, since the HPFP is mechanical, the fuel pressure dropped because of the misfires rather than vise-versa? Anyhow, thank you so very much to everyone, especially E9C900A for all the great advice. It's nice to have her running as she should. Well, the misfires have returned. A few good days, and now it's undrivable trash. Forgot my scan tool at work, so no idea what is causing the issues now, but it's worse than ever. New coils all still check out fine (primary side anyway, didn't check secondary resistances) I still think it's fuel related, but just guessing since I couldn't scan it. FML. Last edited by E9C900A; 04-03-2019 at 08:45 AM. I delayed the fuel line replacement when the new coils arrived and the car was running well due to the weather. I loaned my scope to a mechanic friend, so I cannot scope the cylinders yet. The replacement coils I bought (Standard Ignition Intermotor line, as my local dealer didn't have any OEM available for a week) are what caused the latest issue, went bad in 3 days. All 4 are already out of spec , primary spec okay, all are .08 ohms, but way low on the secondary side (5.48k, 3.55k, 5.55k, and 5.48k). The oddest issue now, is I cannot get a secondary side reading on my original coils I took out. The primary side all still read 0.10 (with a .01 correction factor on my meter, so borderline high end of acceptable .09 ohms), but the secondary side shows open on all 4, yet the car was still running on them, admittedly not well. Last edited by Richtazz; 04-04-2019 at 05:16 PM. Learned my lesson, will get OEM coils on Saturday...spendy little rascals. Paying my pittance, having to drive the wife's minivan for a couple days. Soccer practice anyone? Roadster and TooGqForYou like this. Oem coils are less than $200 shipped a set and can get them in less than a week. Okay, sorry about the delay in responding. The OEM coils fixed the misfires and the car is running well. 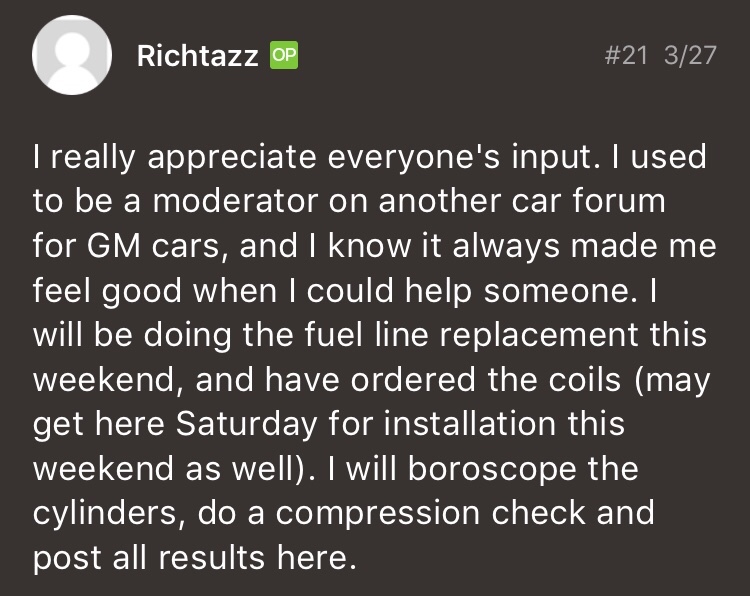 Compression test was done and all cylinders are well within spec (all were with a few psi of each other in the 185-190 range) after warm up and with coils and fuel pump disabled. Boroscope not done, as my mechanic "buddy" broke mine ( I know better than to loan people my tools...grr! ), so I'm waiting for him to replace it. Since the car is running well now, I am less concerned about it's need to be done, but I still want to do it. I want to now address the mods needed to address the factory issues. I have seen differences of opinion on the oil catch can mod. Some have said PCV valve side, some say breather side, some say both. I do not want an oil choked turbo or intake valves, so suggestions please. On the clutch pedal mod, what exactly does this do, defeat the "rev matching" ECM programming that from what I have read seems to cause a hiccup in the 1-2 shift making that difficult to do smoothly? On the torque app for the OBD-Link MX. Does anyone have a good write up or website I can visit to learn this program better? The OBD-Link MX is a pretty impressive little device I must say. Also, is there any app that would make it ABS compatible? Lastly, I am blessed to know my dealer's parts people and one of their service guys personally through work. They told me that this upcoming recall will most likely affect my car since it's a 2013, and may even get me reimbursed for the coils. We will see on that. So, thanks again to everyone that has answered my past questions, and thanks in advance to any and all that answer my new ones. This forum is an excellent place to go for answers. Last edited by Richtazz; 04-14-2019 at 08:50 AM. That is one looooooooooong convoluted thread. So many different opinions and "solutions" to the issue of oil vapor coking. At first I thought why put a catch can on the breather side, that's incoming air... until I read how these turbos start venting through the breather side as vacuum drops on the pcv side and it closes (excess CC pressure has to go somewhere). So much info, but good info to have for a forced induction noob like myself.